Dozens of clubs across Montreal will spray human blood all over their guests this Halloween in a gross-out event that has many critics gagging. “Is it disgusting and unsafe? Sure! But that’s half the fun,” says club owning hematolagniac Jason Krueger. “I got the idea from the Netherland’s Blood Rave events, a modern take on the ancient Dutch tradition of Gutenblaak, a pagan ritual for the fall equinox that involves bathing in the blood of dead fat children. I told my promoter friends about Gutenblaak, and now most of the clubs downtown will be hosting blood spraying events of their own. It’s going to be a bloody Halloween." The Netherland’s banned the practice of Gutenblaak in 1994 after reformers won a narrow referendum on the matter. “Gutenblaak might have been outlawed, but the Dutch fascination with smearing their bodies with blood hasn’t gone away,” says Jason. “The Blood Rave is a more politically correct version of Gutenblaak. Since it doesn’t involve killing fat children, the authorities are powerless to stop it. I hate that we live in a world where morally righteous do-gooders are busy trying to sap society of all it’s rough edges. The world needs weird, psychotic events like Gutenblaak. We need to occasionally slaughter the innocent and cover ourselves in their bloods. Human beings are predators and we should celebrate our killing instincts, not try to pretend that they don’t exist." The world’s recent fascination with Gutenblaak baffles Dutch authorities, who find its popularity embarrassing. “I don’t want the Netherlands to be associated with blood bath parties,” says Dutch culture affairs minister Henrik Bovine. “There are countless other cultural practices that better represent our people. Our love for exquisitely crafted wooden shoes, our fantastic meat based pastries and our cutting edge pornographic virtual reality industry. These are the kind of things that I wish foreigners would associate with the Netherlands, not that godforsaken barbaric pagan ritual Gutenblaak. The Dutch have moved on from the days when they would bathe in the blood of fat children. We are a now more civilized people, and these blood rave events are offensive. I hope the people of Montreal will respect the people of the Netherlands by saying no to Gutenblaak. 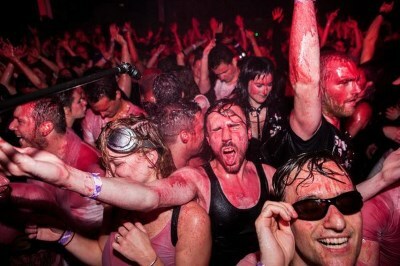 Blood raves aren’t just gross, they’re also a grotesque caricature of dutch traditions."